Telegraph Avenue — a place that stood out to me and many others when we were prospective students and continues to capture my curiosity as I take my usual routes to class. 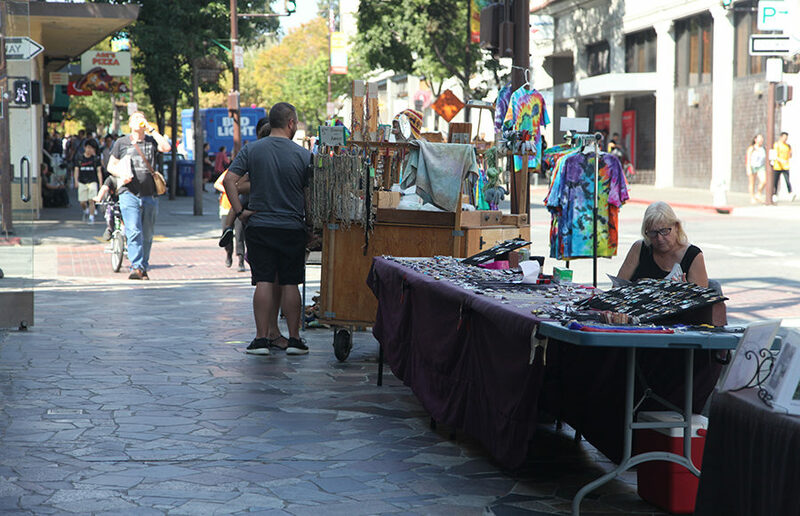 For the average UC Berkeley student, the clusters of street vendors that line Telegraph Avenue are a familiar sight: collections of tie-dye T-shirts and woven bracelets adorning tables at nearly every corner. These vendors seem to have claimed ownership of their portions of sidewalk, and I’ve often found myself using them as directional reference points when navigating the lively street hub of Telegraph Avenue. Before I joined the ranks of UC Berkeley students, my older sister would send me intricate woven bracelets that she bought from one of the many jewelry stands that line the street near Unit 3 during her freshman year. My favorite of these resembled a strand of DNA as it twisted around my wrist. By the end of high school, I had a small collection of these handmade, one-of-a-kind street tokens. As businesses open and close their doors from year to year, these humble vendors have remained as a constant element in an evolving marketplace. When Pacific Cookie Company and Smart Alec’s Intelligent Food said their farewells to Telegraph Avenue, the stand where my bracelets were made still remained, the owner — who goes by Twig — continuing to weave strands of twine and hemp into unique mementos. Twig, who has been selling woven bracelets and other collectible items on the corner of Telegraph and Durant avenues since before I was born, admitted that he has witnessed a lot of change in Berkeley, especially in terms of its business culture. “Corporate is trying really hard to get in,” Twig said, describing how companies like Subway and Peet’s Coffee & Tea began cropping up along the avenue. Similarly, I have seen neighborhoods in my home city of Los Angeles drown in a wave of gentrification, many communities suffering losses of cultures with residents driven from their homes because of skyrocketing rental prices. Venice Beach reminds me of Berkeley in many ways — quirky and unconventional at its core, yet gradually succumbing to the forces of urban development. For instance, Abbot’s Habit, a famous coffee shop that occupied a section of Venice Beach’s famous Abbot Kinney Boulevard for 24 years, permanently closed its doors this summer, much to the dismay of many loyal local customers. The neighborhood gathered at the coffee shop during the weekend prior to its closure, and I watched artists and musicians flood the space during a farewell concert for the charming local coffee joint. It was a moment of upset, but also of recognition. Change is occurring, and it is the locals who have the power to prevent some of these calamitous transitions and preserve the past. Twig, who began selling his items in that very section of Venice Beach, was especially troubled to hear that the local art and music hub had fallen victim to rising real estate prices in the area. The people of Berkeley have demonstrated their resilience in preventing the obliteration of the city’s cultural roots, from protesting the development of People’s Park to hosting events such as the Berkeley World Music Festival, a celebration of diverse local artists in an effort to promote local performers and provide a platform for artistic expression. But the shopping districts around Telegraph Avenue are underperforming, an issue that the Telegraph Business Improvement District, or TBID, has sought to resolve. TBID has discussed this issue and executed projects to improve the street’s business performance. The “Telegraph Public Realm Plan,” adopted in June 2016, provided design guidance for Telegraph Avenue that focused on improvements to the sidewalk and the general pedestrian environment. But the question remains: How does Berkeley encourage the development of its business districts while preserving a place for art and culture? While bringing more corporate stores might attract students and benefit the city economically, it puts local crafters and small businesses at risk. According to Twig, what Telegraph Avenue needs is new, creative vendors who can transform the street to the eccentric and bustling street market it once was. Hopefully, the city can retain its unconventionality and vibrant culture, even amid an influx of modernization and change. Contact Molly Nolan at [email protected].